Durum wheat is also known as Macaroni wheat. Durum in Latin means hard and this species is the hardest of all wheat. 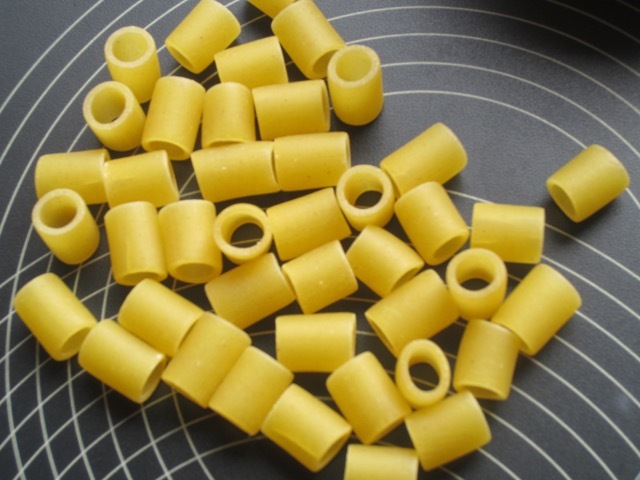 Durum kernel has a yellow endosperm, which gives pasta its colour. Durum is the only tetraploid wheat species (with 4 sets of chromosomes) of commercial importance that is widely cultivated today. It was developed by artificial selection of domesticated Emmer (T. dicoccum) and is awned like Emmer. Why is Durum wheat good for pasta and not bread? Its high protein content and hardness makes it suitable for pasta but since it’s relatively low in gluten, it does not make good bread. Bread wheat (Triticum aestivum) has strong and elastic gluten. 100% durum wheat breads are often heavy with close grain and usually split easily when risen and ready for baking, because the flour lacks the elasticity of bread wheat. The gluten protein in durum is strong but not elastic and is therefore, mostly suitable for pasta. Commercially produced dry pasta (pasta secca) is made from durum wheat. The coarse flour used to make the pasta is called durum semolina. Homemade fresh pasta (pasta fresca) such as Orecchiette, Cavatelli and Malloreddus is also made from durum semolina. Tagliatelle is only made from soft wheat often “00” or combination of soft and hard wheat. Finely ground durum wheat flour is used to make flat round breads in Middle East and can also be used to make pizza.